If that stream doesn’t work, try Ultra4’s official site. KOH is sort of the Super Bowl of the Ultra4 Race Series. Or at least, it’s the biggest spectacle in the sport and easily one of the most spectator friendly off-road racing events all year. 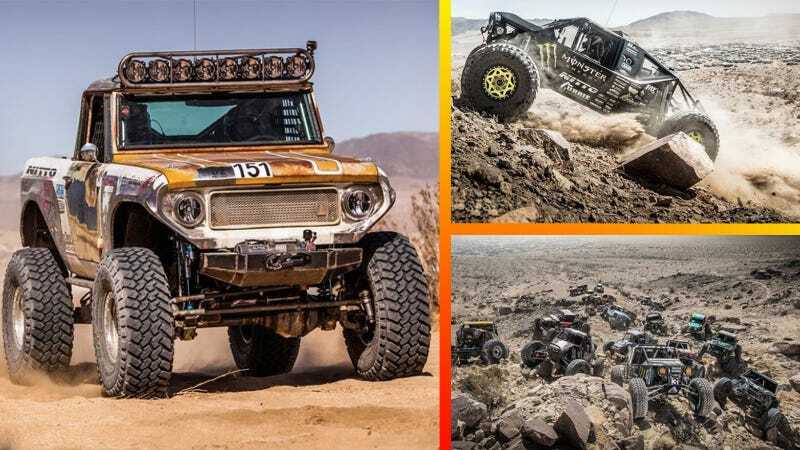 If you already know about Ultra4 cars, you’ve seen the 40-inch tires, screaming V8s and badass scratch-built frame bodies that get flung over rough tracks all over the world. If you’re still getting up to speed: Ultra4 cars are like Jeeps if Jeeps took the Capitan America serum and also put on Iron Man suits. Sorry, we were talking about The Avengers last night and that got stuck in my head. Anyway, after a night of watching fans thrash their personal vehicles through ridiculous obstacles, we now get to see some of the most elite off-road drivers drive, scramble, winch and bash their way across hundreds of miles of rocky desert. Will There Big a New King? Four racers have won KOH the past eight years, demonstrating that it takes a lot more than luck to be on the top step. Will one of them win again this year, or will a new King ascend to the throne? All Kings have returned in 2018 except for 2007 winner JR Reynolds. Shannon Campbell is the only driver to win KOH three times. Scherer is the only King at KOH 2017 that hasn’t won the title twice. He finished 2nd in 2016. Healy and Slawson are the only two drivers to win KOH after having to qualify through the LCQ. 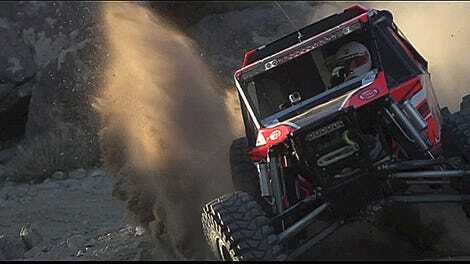 Only one driver has won King of the Hammers in a single-seater with independent front suspension—Shannon Campbell. Wayland Campbell- Came in second last year to his father, won the 2017 season championship. Levi Shirley- Came in second in 2017 season points and finished third at KOH in 2016. Josh Blyler- Finished 6th in 2017 in Miller Motorsports solid axle car. Randy Slawson- Two-time KOH winner, and the harder the course the better Slawson traditionally has done. Erik Miller- Debuting a new car that is an evolution of his previous KOH-winner solid axle cars. Loren Healy- Racing a brand-new Jimmy’s 4x4 two-seat IFS car with LSX454 power. Bailey Campbell- After finishing 5th in 2016 in a two seat, front engine, solid axle car, is now debuting an IFS car. Brian Caprara- Debuting a new Campbell Enterprises IFS two seat buggy. John Webb- Crowd favorite will have a new Fishmouth Fabworks IFS car, complete with his signature speakers blasting on race day. Nick Nelson- Past ULTRA4 season champion is coming back with a new Jimmy’s 4x4 car. Jordan Pelligrino- After racing in 4500 is moving up to take father’s place in GenRight 4400 car. Shannon Campbell - Never count out three-time King whose experience, driving style, and absolute focus on winning makes him a formidable competitor. Jessi Combs: Won 4500 Every Man Challenge in 2016. Competed in the main race as a driver for the first time in 2017. This is her 8th time racing KOH. Host of The List: 1001 Car Things To Do Before You Die. Is racing in 4600 on Thursday and 4400 on Friday. All Drivers must commit to an ULTRA4 Regional Series to participate in The Triple Crown These are additional races and cannot be raced in lieu of regional races.